Course Subscriptions is a new enhancement to the existing subscription feature already available in LMScheckout. The original subscription model was designed to provide users with unlimited, site-wide access to all courses during the term for which they paid. In response to customer requests, this new subscription option allows individual subscriptions to course, program or class. This feature is also referred to as a course installment plan. 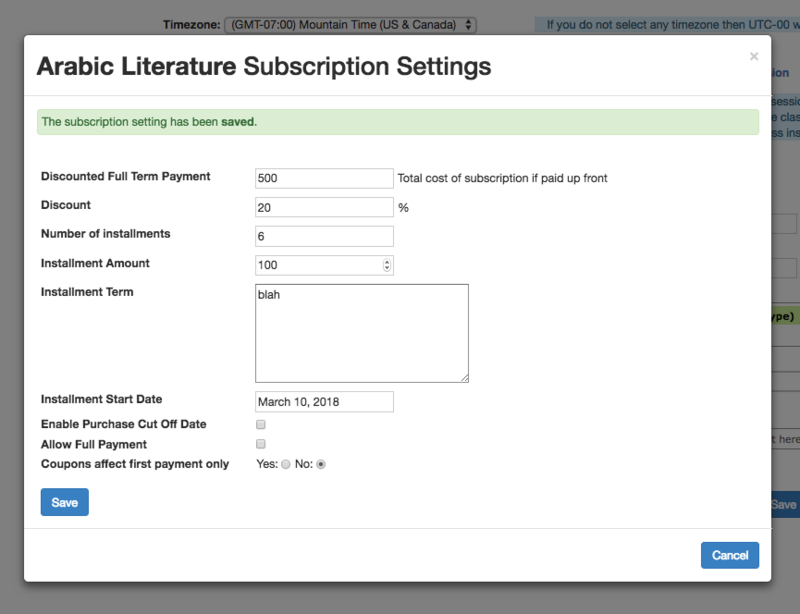 The new subscriptions model applies to both an on-demand subscription term course or a fixed date course scheduled to start sometime in the future. This model allows users to either defer full payment by paying for a course in installments over a set period of months or pay the entire subscription up front. Additionally, store owners will now have the option to create a discount for users who chose to pay the full amount upfront. By default, the pay upfront option is pre-selected and the course total will display with the full upfront cost entered on the settings page. In either the fixed date or the subscription term model, the admin assigns the parameters of the subscription. These settings include the upfront cost of the course, a discount percent, a schedule of payments, and a price per installment. In the case of a fixed date subscription, the student buys the course and is charged the first installment as a deposit. The rest of the payment schedule is determined when the admin sets the date to initiate the installment cycle. Course subscriptions are a great way to provide more purchase options for your customers, or as a marketing tool to provide incentives to encourage buyers to pay upfront.